I’d wanted one of these bandsaws for a very long time but I didn’t think I had room for one. For years Harbor Freight regularly had them on sale for $160, but of course once I needed one I found the sale price had gone up to $230. I was ready to pay that but I decided to check Craigslist one more time. I couldn’t believe it when I found this one for $50, which included a brand new Lenox blade which was probably worth at least $30 by itself. I had to replace the power switch but it works great and I get very square cuts with it. 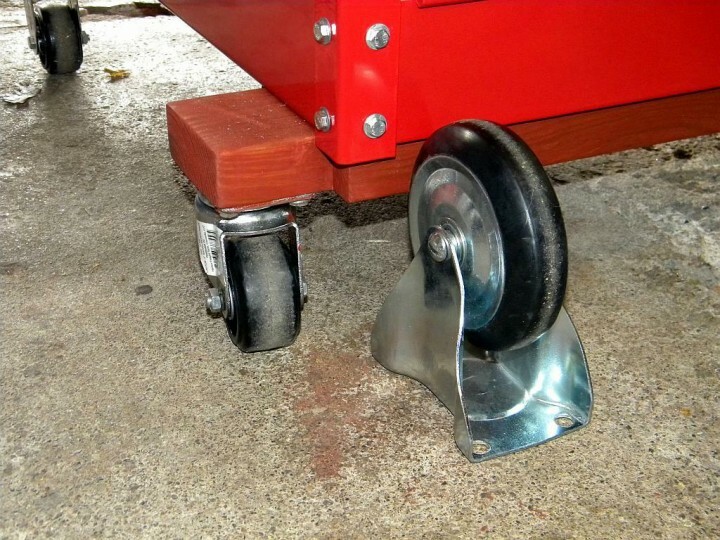 This photo shows how much I lowered the cart and moved its wheels apart by replacing the originals with smaller casters mounted on outriggers. Parts of my garage floor are badly pitted and I wanted to make certain there was no chance the saw could tip over. A close-up showing how I mounted the saw to the cart. I just bought a pair of these from eBay. Supposedly, one works and one doesn’t, but it also said the power switch was broken. 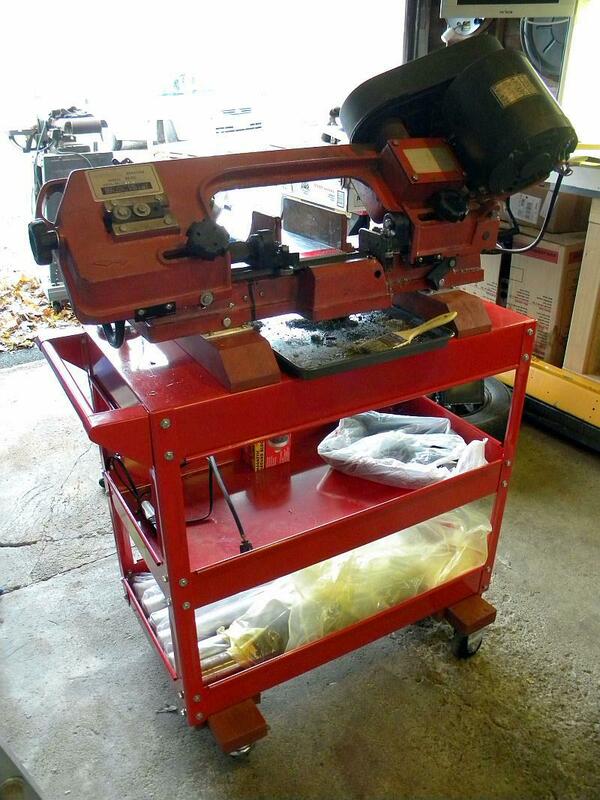 I’m hopeful that I can get a second working saw out of the deal, and sell it to fund my purchase. If not, I still got a great deal on a saw. Naturally both stands are showing signs of rough handling. I’ll replace the one for my own use, and leave it up to the new owner as to the fate of the second. Excellent! Let me know if you need a switch. I think I have a extra you can have. BTW, do yours shut off automatically after they cut through the work piece? Mine does, but it looks like some don’t. 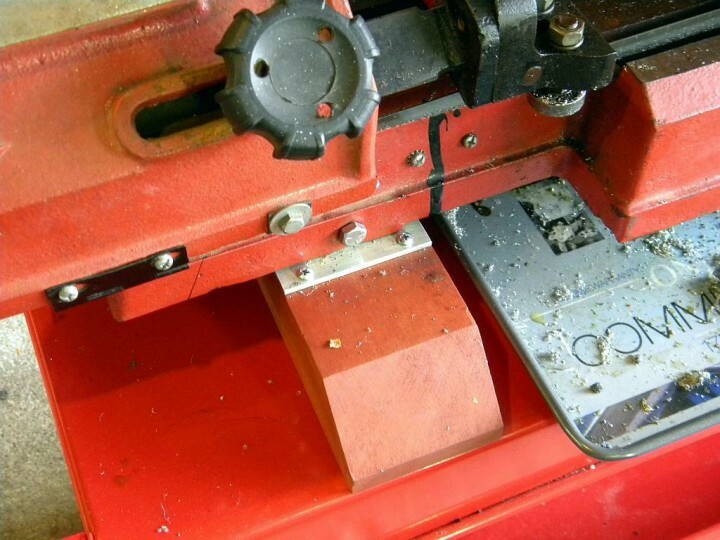 I bought a bandsaw from ebay and I was disappointed about it, everything is almost damaged entirely. I suggest you buy from amazon. To combat a sour attitude, use kind words.